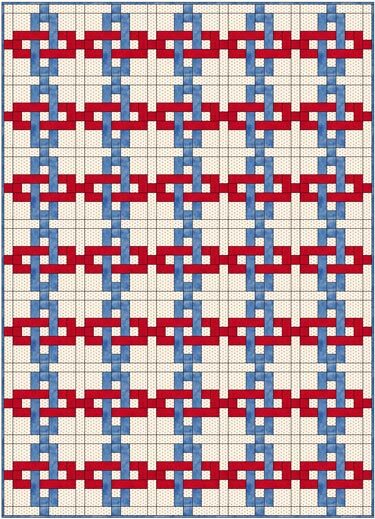 Chain Link Quilt Block Pattern: 7", 10-1/2" and 14"
The Chain Link quilt block is deceptively simple. 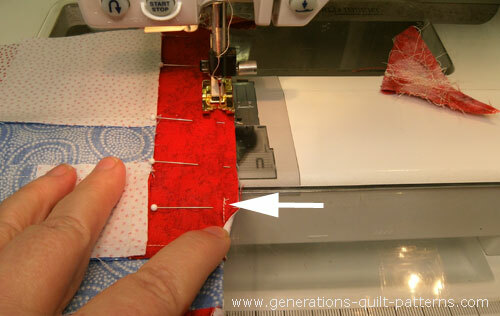 To complete the block you'll use a technique called 'partial seam' or 'puzzle piecing'—which means nothing more than the first seam partially sewn at the beginning and finally completed with the last one. 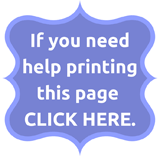 There are pictures to help you every step through the process. 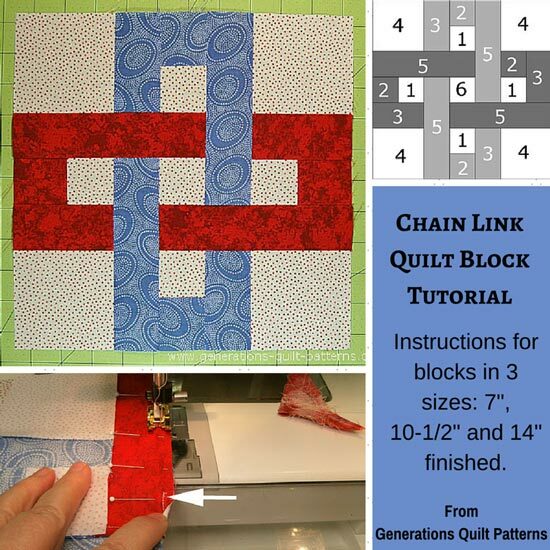 To set these blocks into a quilt there's a suggestion for a sashing design (at the bottom of this page) that completes the illusion of interlocked chain links. 1/4" seam allowances (SA) are used throughout. It looks complicated in the design drawing (right), though it's really all the same unit, just colored two different ways and then rotated around a center. 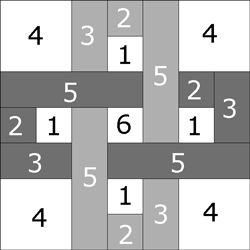 The same piecing order is used for all four units. 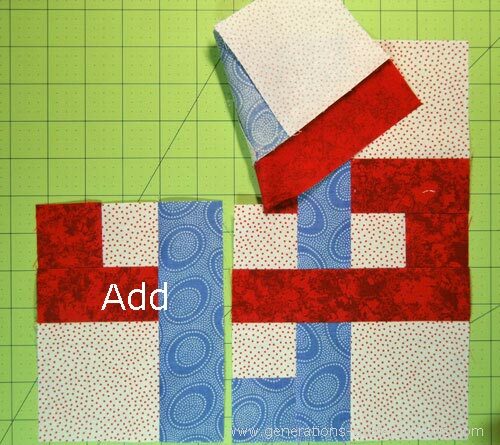 There are two sets each of two different fabric placements. #2 and #3 in each unit are one chain fabric; #5 is the other. Use the photos in this tutorial as a guide. 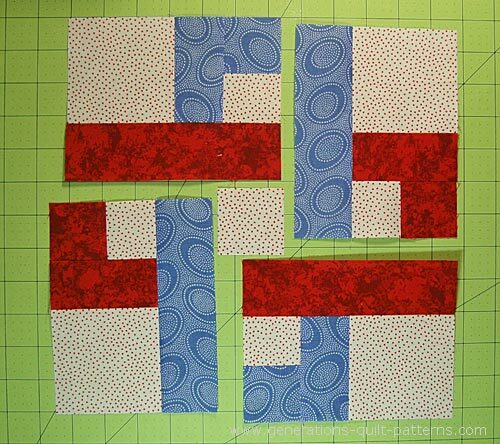 All the SA in this block are pressed AWAY from the chain link fabrics (A, B) and towards the background. Press after the addition of each patch. With right sides together (RST) stitch #1 to #2. 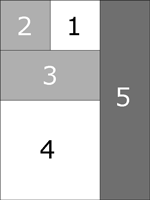 Two sets use A fabric and two use B. Press SA toward the #2 patch. With RST, add the #3 patch. Press in the direction of the arrows. With RST, add #4. SA are pressed toward #4. And finally add #5 with RST. The #5 is the color of the other link. Use the photo below as a reference. SA are pressed toward #5. 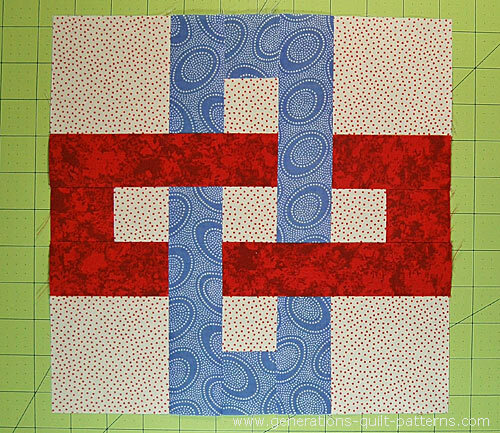 Arrange the pieced Chain Link units around the center #6 square. 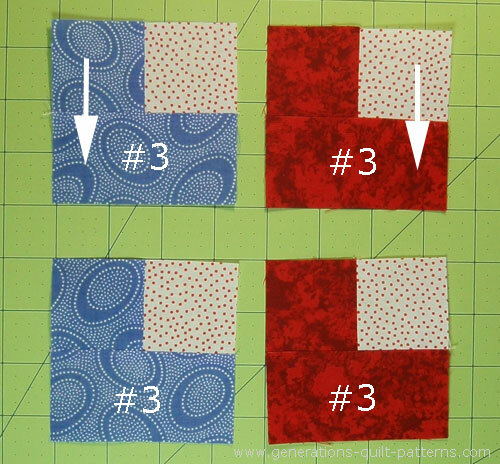 As you move clockwise around the block, alternate the #5 A and B fabrics to form a link. 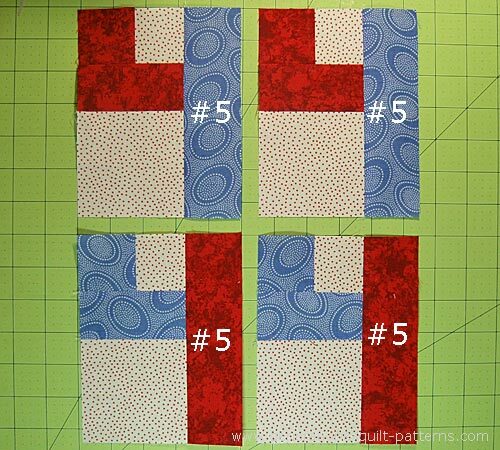 For the remaining steps all the seams are pressed toward the #5 rectangle and away from the center, #6 square. Press after adding each pieced unit. Fingerpress the SA toward the #5 rectangle. With RST, add the second stitched unit. You can see that only about half of the seam connecting the first unit to #6 is stitched. This is a complete seam. I use pins to keep the edges neatly together. Pinning helps keep the cut edges lined up nicely. 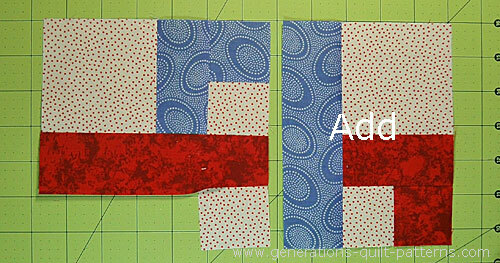 Add the third pieced group of patches, stitching the length of the patches. With RST, add the fourth pieced group. Again, this is a complete seam. This last seam is a partial one—remember we stitched a bit of it at the beginning of assembling the block. I stitched from the #5 side because it is easier to see the previous stitching. The pins are used to keep the edges straight AND to hold the SAs on the other side in place so that they don't flip during stitching. The arrow points to the end of our first partial seam. 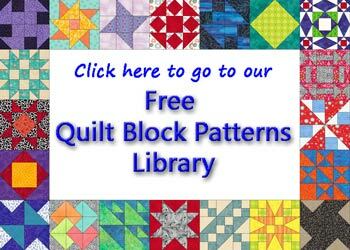 Give your Chain Link quilt block one final press and here it is! 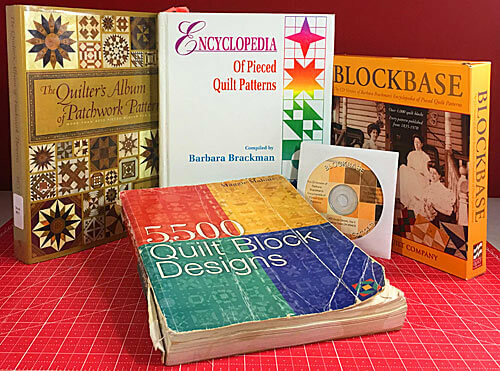 If you choose to make a quilt out of this block, you might want to consider using a sashing that links the chain like the one to the right. 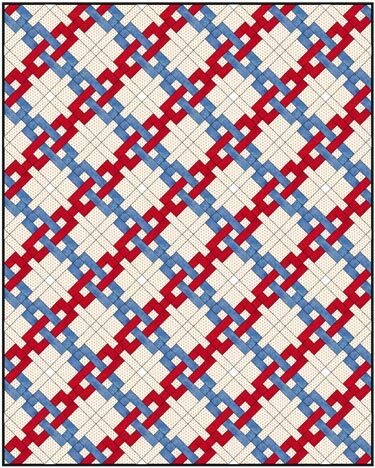 Add it into a straight set quilt layout and it looks like this. 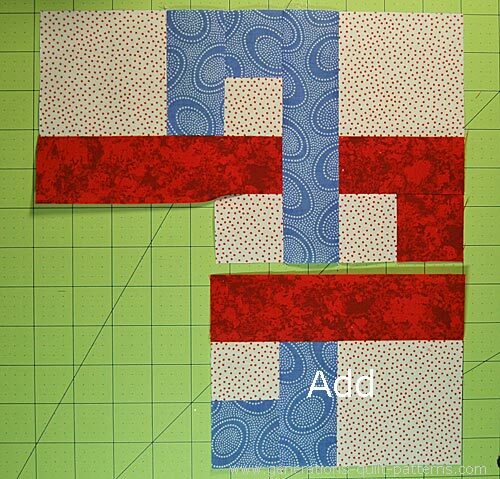 Use the chart below to cut fabric for the sashing strips. 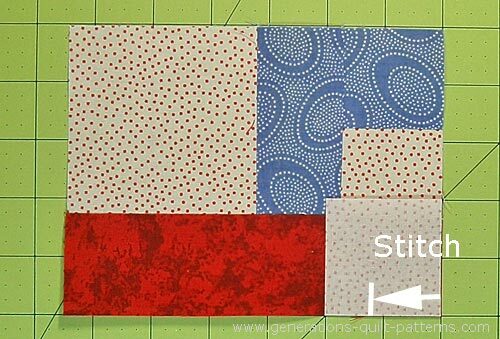 The amount of sashing you'll need depends on the number of blocks in the quilt and whether or not the it's used in the border (as shown above). Press the SA toward the center patch so that they nest with the seams in the block. Now add a bit more drama by setting the blocks in an on-point layout. The sashing remains the same. 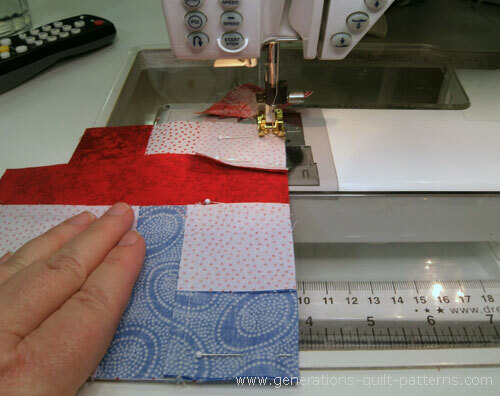 A fun little quilt that any beginning quilter (or an experienced one for that matter!) would be proud of.